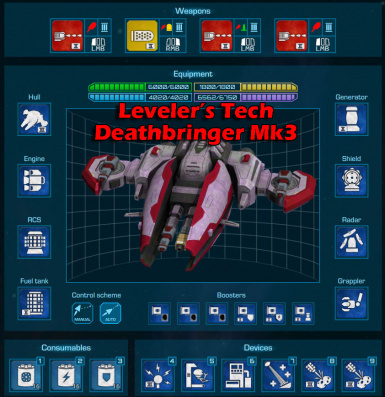 Adds several higher powered items from ship hulls to boosters, devices, engines, fuel tanks, generators, radars, rcs, shields, energy and ballistic weapons. Now included good as well. * You may use this mod any way you see fit. * You may use this mod in your own mods. * Credit would be nice but not necessary, I will not police mods using these changes. * Use this mod at your own risk to your save games. Thanks to Atomic Torch Studio for the game and allowing us to mod the same. 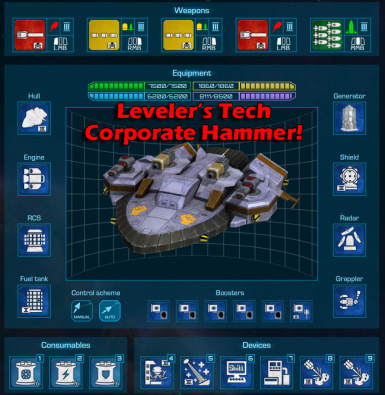 Adds several higher powered items from ship hulls to boosters, devices, engines, fuel tanks, generators, radars, rcs, shields, energy and ballistic weapons. These items will all cost more than their lesser companions of the same type. These items are also mostly found at the higher tech level space stations. Each item comes with a new texture icon so you can find them easier. In the game, click on the 'Mods' button and you should see this mod in the list. Click the box so there is a check mark in it. Play the game and check space stations for the new items. You may have to search around at higher tech stations to find stuff. 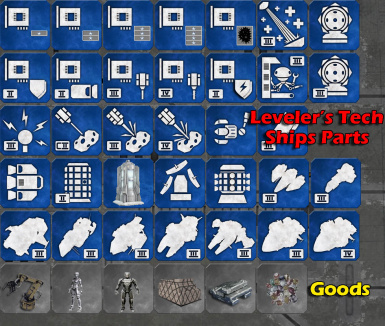 Delete the 'LevelersTech.mpk' file from the above mentioned mods folder. As these are all new items, there should be no incompatibility. A save game with this mod installed will require this mod to load.